I had coffee with a friend this morning at Seattle's Uptown Espresso in Belltown. As we waited on the barista he remarked how much he liked the spacious and uncrowded feel of the place. I had to agree. 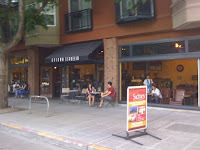 Far too many espresso shops are cramped and sterile, especially many of those branded by a local, ubiquitous chain. They aren't a third place; instead they come in last in any ranking of places I'd care to linger. The Uptown also has a good selection of comfy chairs and even a small separate meeting room. Best of all, it has some of the fastest internet in the city--for free. This morning was cool with low clouds so it was glassed-in along the sidewalk. In warm weather they open it up widely, merging street scene and cafe. The bus stops right in front. The coffee is good, the atmosphere inviting. Is there better anywhere nearby?